After the Winter Wonderland extravaganza we strolled along Oxford Street checking out the lights. We ended up here just outside Selfridges (to the left) for ages as I tried to get a decent light trail/star combo and Andy had a go at panning through the bus windows. My best looking trail shot got photobombed by an errant motorist (even showed her the resultant photo as she stuck out into the street) but actually I kind of liked this anyway. @robinwarner oh yeah, we always do, and there's always room for one more! Beautiful shot. 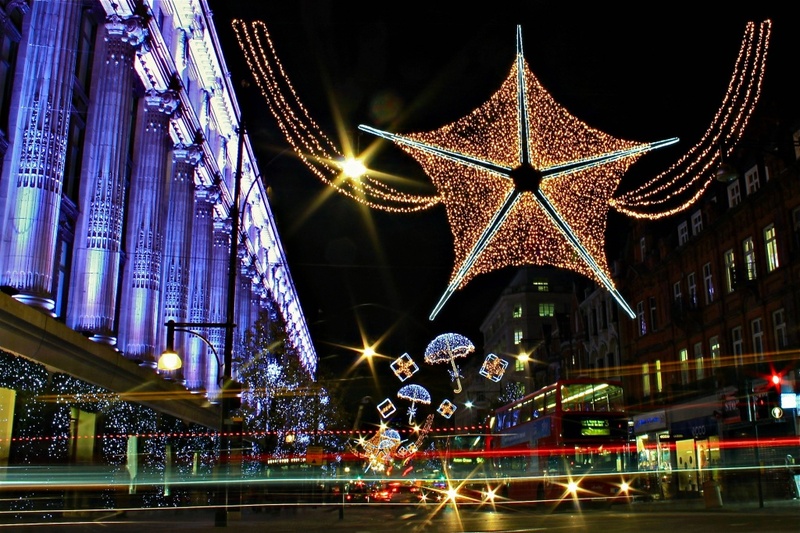 It's been years since I've been to Oxford St at Christmas. @andycoleborn yeah good idea of yours to cross over the road! That hanging star is a treat as well! Great colours and trails, and the London buses make a lovely addition to the light show. I think it turned out amazing! Errant motorist or not :). @fueast Ah they're not in this one. Stunning! Reminds me of something off Doctor Who - an alien starship? Very pretty. I like the little brollies. So much to see in this! The purple colmnns on left seem like liquid metal... the star is eyecatching! Even the car making the streak...the colors are holiday colors, so it is all good! I love your street scenes.